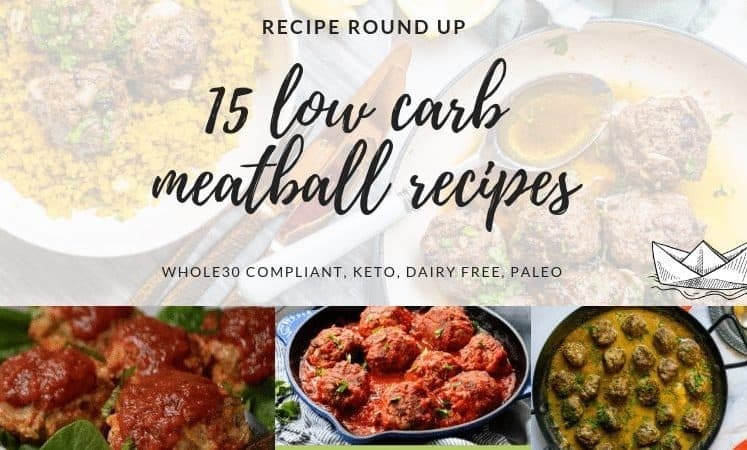 It’s no secret that I love meatballs, and I also love Mediterranean flavors! 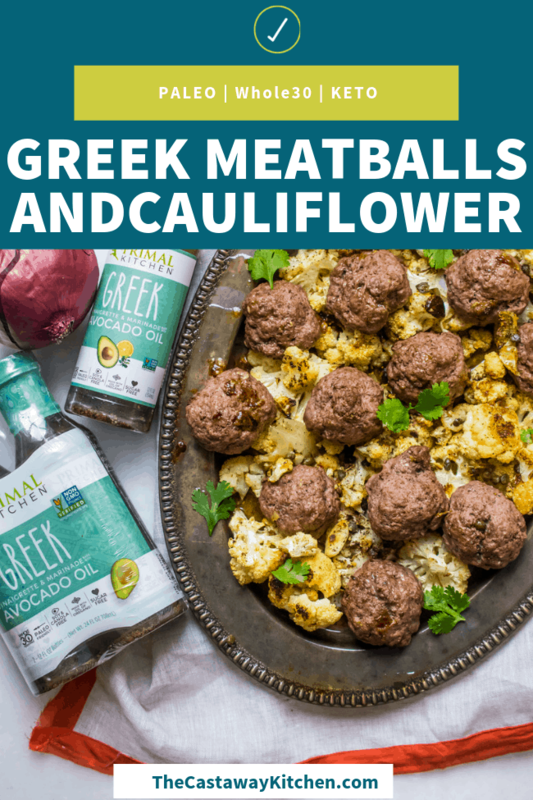 I developed these Greek Meatballs with Caper Cauliflower for Primal Kitchen, to celebrate their Greek Dressing and Marinade being available in Costco! 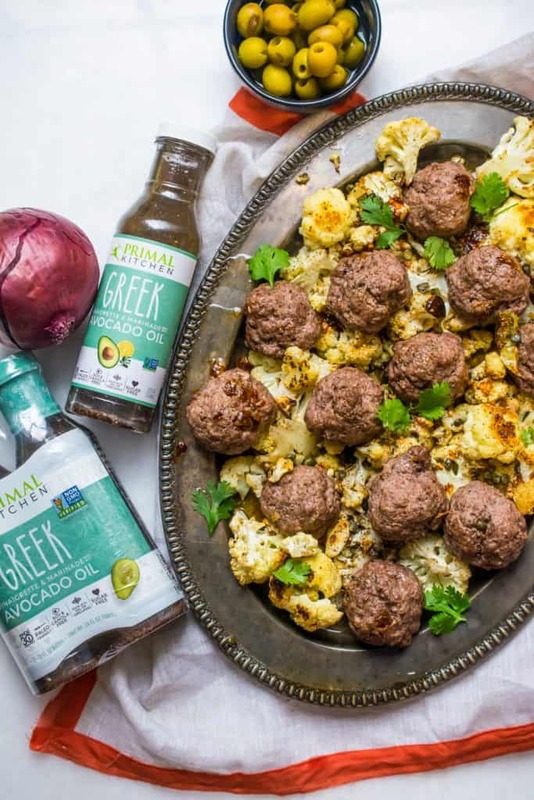 Their Greek dressing is versatile, delicious, nightshade free and Whole30 compliant! I also have a Greek Dressing recipe in my cookbook Made Whole! This stunning meal is actually a SHEET PAN MEAL! YUP! Everything cooks in the oven simultaneously for an easy, nutritious and very flavorful meal the whole family will love. 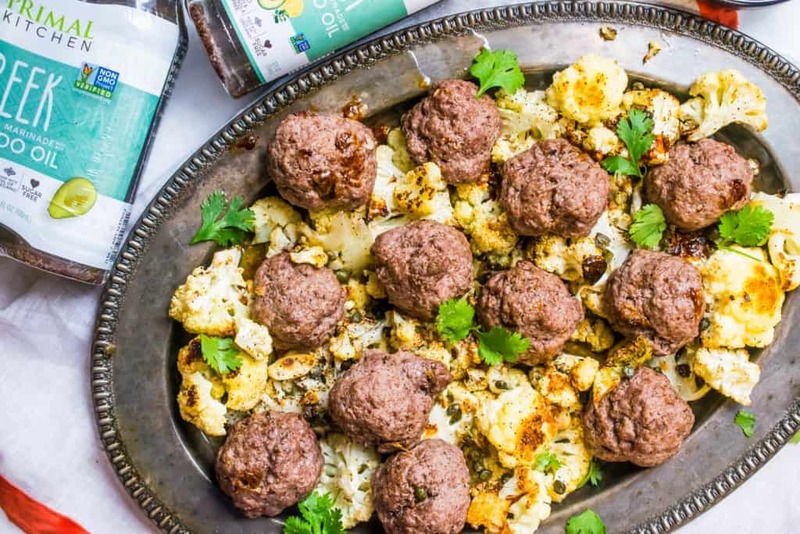 Perfect for meal prep or feeding a crowd, this Greek Meatball with Caper Cauliflower dish is sure to turn heads. Yes! The addition of copious amounts of this avocado oil sauce to the meat is met with a good amount of ground flax meal to soak it up and serve as bread crumbs and a binder! No need to involve eggs. If you can’t have flax, you may use psyllium husk powder too. 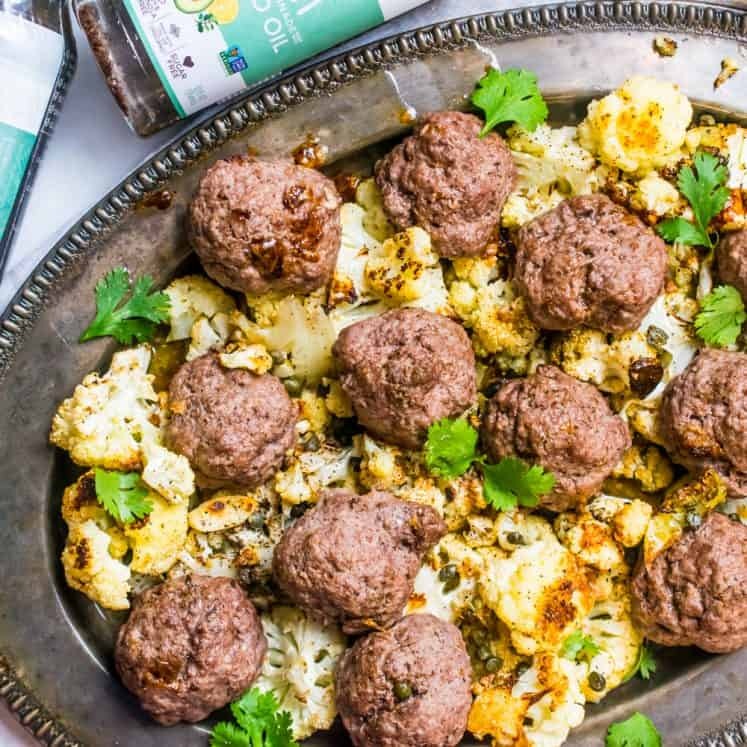 The golden cauliflower with briny capers that roast up alongside these Greek Meatballs is the perfect side dish. Completing the Mediterranean flair of the dish and satisfying your palate and your belly! 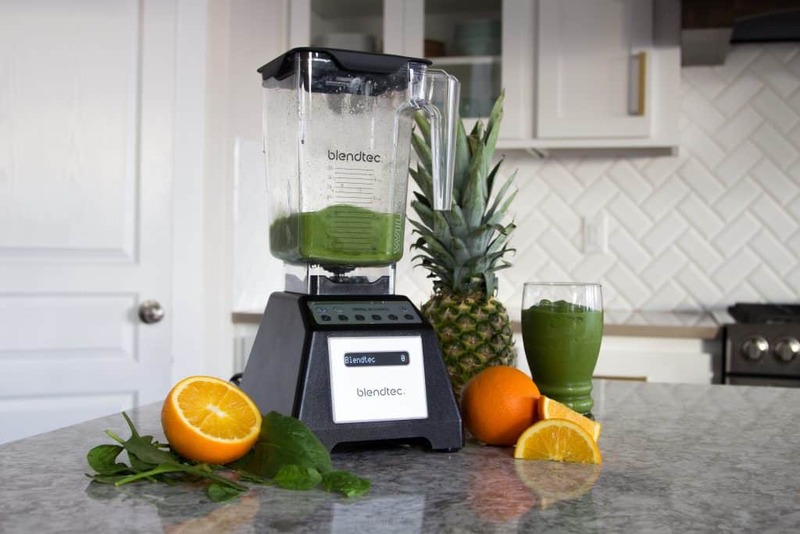 Enter To Win A Free Blendtec! 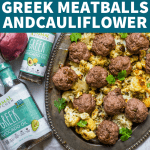 Delicious and flavorful Greece Inspired Meal! Pre-heat oven to 400F. One rack on the bottom, one rack in the middle. Lightly grease two sheet pans and set the aside. In a large bowl combine the ground beef, flax meal, Greek Vin, and salt. Mix well and shape 12 even sized meatballs. In the same bowl toss the cauliflower florets with the garlic, salt, pepper, oil, and capers. Toss to coat the florets in oil and spread everything out evenly over the second sheet pan. Place both sheet pans in the oven. Meatballs in the center, cauliflower on the bottom. Roast everything for 30 minutes. Remove the meatballs from the oven, place the cauliflower right under the broiler and broil for 2-5 minutes to get a nice brown on the florets. Remove from the oven. 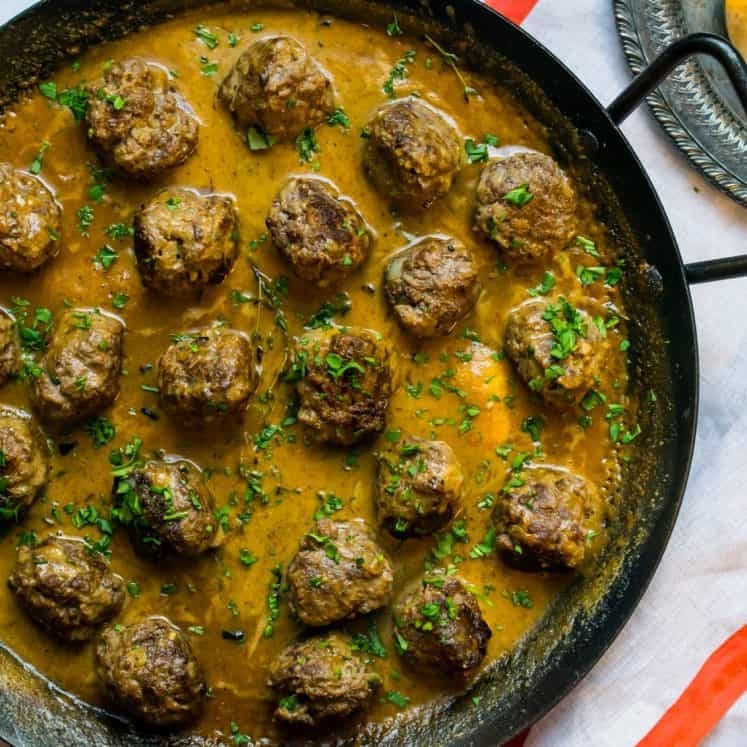 Serve together, spoon pan drippings from the meatballs all over everything! Yum! This looks amazing! I love meatballs! These are some of my favorite savory foods. I can’t wait to try it. Thanks for the recipe!